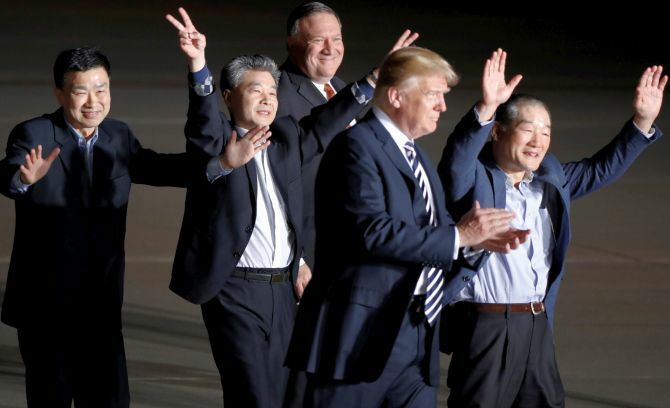 We witnessed late last night something that has not been seen in years, North Korea willing to give up hostages in good faith to the US without concessions given. We also saw attacks against Israel by Iran, Israel being Israel responded in the same way they have for years, you fire on their territory, they are going to strike back with overwhelming force. In what many liberal news outlets were calling a failure on the part of Trump, amid cries from the left that he was pushing the US towards a nuclear war, we now see him vindicated by his actions, instead of caving in to pressure and bullying tactics from North Korea, instead standing up to them and answering back in kind, like most bullies when they saw there would be a fight, North Korea gave in. We now have a summit with their leader and Trump, there is talk if this gets done Trump could win the Nobel Peace Prize, something that is driving the Never Trump crowd crazy, and we are on the way to at least talking things out rather then threatening. When Trump was signing the paperwork to take us out of the Iran agreement, the New York Tims noticed Sec of State Pompeo was absent, rather than do any checking they ran an attack article on him, turns out while they were busy with their fake news to try to attack Pompeo, he was in North Korea in secret meetings winning the release of 3 American hostages, it was fitting that they ended up wearing egg on their faces over this. In a move that should surprise little of us, this bastion of fake news then went on to attack Trump in his not stating what his conditions and expectations were, guess they are angry that he is winning so much they had to attack any way they could. The great news out of all of this, Trump keeps on winning, his polling is going up even though the DNC spokespersons, oops, I mean the liberal press is doing everything it can to try to keep his number down. The problem the press is running into is they can lie, but the proof is in the pudding (so to speak), if you lie so long, and everyone sees jobs are back, the economy is recovering, they know things are much different then what the talking heads are saying, soon they respond in the voting booths, this could turn out very bad for the left in the midterm elections. As was expected, Iran did not take long to respond in attacking Israel after Trump pulled out of the Iranian deal. They had set up to attack the day before, but within an hour of Trump finishing his speech Israel thwarted that attack by attacking the sites before they could launch. The next day Iran seems to have done away with having their proxies attack to allow them deniability, had their Al-Quds force launch attacks. In response to the attacks, Israel responded in a predictable manner; they went into Syria, destroy the Iranian infrastructure set up there, wiping out arms depots, radar, air defense sites, and launching sites, the only thing they didn’t strike were the barracks, may be saving them for next time. Israel reacts as they always do, they tell you what they are going to do, they do it. When Iran and Syria started trying to smuggle through Syria advanced arms that could be used against Israel, Israel promised they would destroy them if they could catch them in transit, the fact that they are doing this, as they did a couple of days ago should come as no surprise. Iran wants to be able to send more rockets to Hezbollah, set up their short-ranged rockets in Syria, Israel is having none of it, as long as Iran keeps pushing Israel will keep destroying them. Now it is up to the two sides to decide what they are going to do, Iran can figure out that Israel will not back down, even if this leads to war, or they can come to some type of understanding, then stop this silliness. Iran at this point is left with two choices, although I don’t think they understand it yet; they can pull back and give assurances to Israel, or Israel will finally tire of this and go in and remove them.